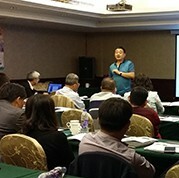 The event, held in Chengdu, Sichuan (China), brought together 25 participants who had the opportunity to learn about and share different experiences of use, tests, and successful cases with Tradecorp products, especially in citrus, grapes, and dragon fruit. The opening of the conference was conducted by Juan Antonio Benavente, Tradecorp Business Manager in Pacific Asia, with a brief speech in which he reviewed the philosophy and fundamentals of Tradecorp in China and the company’s commitment to invest and grow in this country. Tradecorp’s technical seminar centered around salinity, its effect on crop nutrition, and nutritional strategies in saline environments. The seminar was presented by Cathal Daynes, phD Agronomist and Technical Manager of Tradecorp in Pacific Asia. The seminar also included the participation of José Nolasco as an invited specialist who gave a speech on “Nutritional Management in Citrus”. Nolasco is the Director of Marketing and R&D at Tradecorp and Associate Professor at the Polytechnic University of Madrid (department of Agricultural Production of the Higher Technical School of Agricultural Engineering, Food and Biosystems.